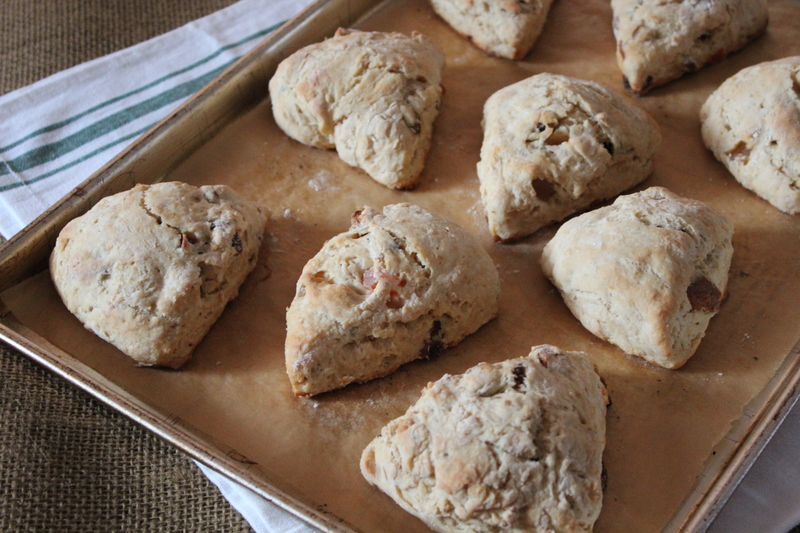 This post might also be called “How to be a Better Scone Baker”. Have you always wanted to make scones, but thought they were too difficult or there was something tricky about making a perfect scone? It’s time to get over all that and take the plunge. With just a few simple tips, you too can be enjoying flaky tender scones. The very first thing you must do, is stop expecting perfection. A scone is not competing in a beauty contest 🙂 But it will be so lovely to bite into! So today, let’s talk about 3 ways to be a better baker. A few small nuggets of advice to help you build confidence in the kitchen whether you are baking scones or something else. 1. Have a good understanding of your oven. Not ovens in general, but YOUR oven. Some ovens have hot spots, or areas that get hotter than the rest. You may have noticed that a cake rises unevenly or becomes more browned on one side. If this is happening, you need to rotate your items during baking. The very best thing you can do is invest in an oven thermometer. This tells you the actual temperature inside the oven, and you may find that it does not match up with what you have set the dial to. If that is the case, you will need to adjust the length of baking time accordingly. Perfectly baked: firm to touch, lightly browned at the edges. 2. You need to follow directions. Yes, really! It’s a must if you want good results. Baking is a delicate balance between flour, moisture, leavening and heat. Chemical reactions are involved that produce the finished baked item. A recipe holds your hand as you go step by step through the process, so trust in the recipe. Not all recipes are good ones, but most of them are, so trust the process. 3. Measure accurately. To repeat my statement from above: baking is a delicate balance between the ingredients. If one of more is out of proportion, the whole thing ends up wrong, and there will be no way to fix it. Flour and sugar should be spooned lightly into a measuring cup, then leveled with the flat side of a knife for an even measure. Brown sugar is the exception. It should be measured packed into the measuring cup, level across the top. Liquids, likewise should be poured exactly to the measurement line on a liquid measuring cup. Measuring spoons should be filled, then leveled off with a knife for the same kind of precise measure as flour. Cut sticks of butter according to the tablespoon markings on the wrapper, these are usually pretty accurate. Directions: 1. Preheat the oven to 400*F. Coat a large baking sheet with cooking spray. 2. Whisk the flours, baking powder, sugar and salt in a large bowl. Using a pastry blender, cut in the butter; or rub the butter into the dry ingredients with your fingertips. Stir in the ADD-INS. 3. Whisk together the milk (or buttermilk) and egg in a medium bowl, stir into the dry ingredients until just combined. Do not over mix. Note: if using a flavor extract, add it to the milk-egg mixture. 4. Sprinkle a work surface with 1 Tbsp. flour. Turn the dough out and sprinkle with a little more flour. Knead three to five times, or until dough just comes together. Divide in half and pat each piece into a 5-inch circle. Cut each circle into 6 wedges and transfer to the prepared baking sheet. From each circle of dough, make 6 wedges. 5. Bake the scones until firm to the touch and lightly browned, 18 – 24 minutes. Orange-Apricot: 1 cup chopped dried apricots, 2 Tbsp. grated orange or lemon rind, 1/2 tsp. orange or lemon extract. To Glaze any of the above: whisk 3/4 cup confectioners’ sugar and 2 Tbsp. lemon juice or milk in a small bowl until smooth. Adjust consistency with a little more sugar or liquid as desired. Drizzle over scones. Smoked Salmon and Dill: 1/3 cup chopped smoked salmon, 1/3 cup finely chopped red onion, 1/4 cup minced fresh dill.